Not every property will have a Hot Water Cylinder. With the advent of modern combination boilers that instantaneously heat water for a property without the need to store the water in an external tank. Think of it as ‘on demand’ water heating and modern boilers are extremely efficient at it. However, many older properties, or those who don’t use a boiler, will likely have a Hot Water Cylinder. Sometimes even with a combination boiler a Hot Water Cylinder will still be used, particularly on larger properties or those using Solar Hot Water panels. Hot Water Cylinders are commonly used in the UK market in two different ways. The first is that the property uses a boiler which burns a fuel source and part of that boilers functionality is to heat the water too. That heated water is stored in the Hot Water Cylinder until it either is used or goes cold and needs to be reheated. This means the hot water stands around potentially for hours until it is used. The second type of usage is by using the cylinder with an electric immersion. This is where at the click of a switch, or for those using a timer a twitch of a dial, the immersion is made active to heat the water contained in a tank. For those who are interested an immersion works in a very similar principle to an electric kettle in the kitchen, just on a bigger size. Inside the tank there are electric filaments that heat the water inside the tank until it reaches the set temperature or that the electric is switched off. This type of Hot Water Cylinder is generally found on properties that mainly use electric heating or without a fixed boiler present. It should be noted that even where there is a boiler and the cylinder is used like in the first example the cylinder is likely to have the secondary function available as a backup. After all, if your boiler blows up, it is useful to still have hot water from the electric immersion whilst the boiler is being repaired. Cylinders vary in shapes, sizes and manufacturers. Some modern cylinders are large sealed units that have been insulated at a factory level. 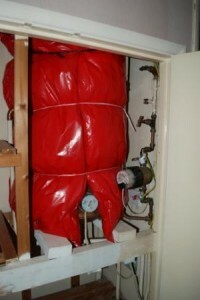 Insulation is very important on a Hot Water Cylinder. Why? Well think of it like this. You are paying money every time you heat your hot water to fill that cylinder because you are using some form of energy which is on your utility bill. Every time that water goes cold and has to be reheated it costs you more money. Obviously things like programmers and timers will help you target specific periods when you want the water heated for, but once heated the hot water within the cylinder will start to cool. The right level of insulation around a Hot Water Cylinder will help slow that heat loss to prevent the water cooling for longer. This in turn means that you have hot water for longer and don’t have to heat the hot water to top up the hot water in the cylinder. Simple, isn’t it? Outside of the factory sealed units, which are normally tested to make sure they have optimal insulation, there are two basic types of cylinder. There is the older style bare copper cylinder which normally has a jacket of insulation tied onto the outside. If this cylinder has no jacket covering it, or there are large areas not covered, then there is nothing stopping the hot water from losing heat almost immediately. The recommended optimal level of jacket insulation is a thickness of around 80 millimetres or 3 inches. The other type is a Hot Water Cylinder which has an outer covering of spray foam. The tell tale feature is that you can only see the actual metal of the cylinder at the junctions where pipes go into the cylinder. The spray foam itself is the insulation for the tank and the recommend depth for an average size cylinder is 38 millimetres or 1.5 inches of spray foam. The best way to measure this is to find one of the areas where a pipe comes into the cylinder and there is a gap in the foam. Take a ruler, don’t use anything sharp or that would damage the cylinder, and measure the thickness from the tank to the outer layer of spray foam. If this level of insulation is less that 38mm or 1.5 inches, then don’t panic! You don’t need to try to top up the level of spray foam or contact the manufacturers for a new cylinder. All you need to do is supplement the spray foam with a cylinder jacket like one you would find on a copper tank. Jacket insulation is pretty cost effective now and can be easily found at most DIY shops or online. It is relatively easy to fit by yourself as well, although a professional company will also provide the service. A simple and cheap way to save yourself money and to keep your hot water for longer! I dont understand why people dont have hot water jackets?! The ammount of properties which I assess, and the tank is completely oxposed to the elements in incredible. They take about 10 minutes to install by yourself, and cost about £10 – its a no brainer! They have a huge impact on the EPC scores too. The thermostat on my cylinder says “DO NOT COVER”. Ive just bought a cylinder jacket, and it shows the whole cylinder dome being covered. Im reticent about doing this if my cylinder says not to. Also, I can see green/yellow wires coming out of the cylinder. I know Im not meant to cover those. Some of these wires are exposed. Is this a fire/safety hazard? I dont want to electrocute myself when putting on the insulation! I have posted your comment question over on our forum where hopefully someone will be able to advise. It’s nice and all but perfect present? I don’t know about that… I’d be pretty disappointed if I got that for my birthday or something..
It’s nice and all but the perfect present? I don’t know about that… I’d be pretty disappointed if I got that for my birthday or something.. I only heat up water when I need it.. a jacket won’t save me money not only that I like the heat exposure to dry clothing the only good thing I can see with a jacket is in the the summer my living room gets like a furnace in the summer and a jacket would retain the heat in ..